Toulan School PhD candidate Erin Goodling is the 2014-15 Special Collections Research Fellow. Erin has already made extensive use of the PSU Library Special Collections & University Archives. Her current research focuses on the Willamette River area and the work of the Portland Harbor Community Coalition as a way to examine social and environmental justice activism in the context of the sustainable city. The Library’s Ernie Bonners Papers and Oral History Collection, as well as early editions of RAIN, one of the first sustainability-focused journals, have been excellent resources for her research. In addition to her research, Erin will be teaching a cross-listed class in Urban Studies and Environmental Science and Management at PSU in spring term. As part of their coursework, her students will conduct historical research using the Special Collections and University Archives as well as other sources, contributing to a multimedia project about the Portland Harbor. 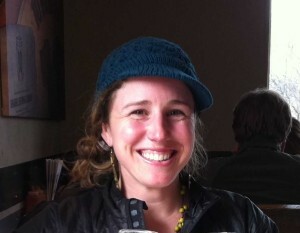 Erin entered the PhD program at the Nohad A. Toulan School of Urban Studies and Planning in 2011. She holds a graduate certificate in English Language Learning from Stanford University, an MA in teaching from Lewis & Clark College, and a BA in Spanish from the University of Portland. The goal of the competitive Special Collections Research Fellowship is to encourage deep and meaningful engagement with the unique primary resources held by the Library. The application is open to PSU Honors and graduate-level students in all disciplines. Library friends Corey and Stacey Lohman have generously funded the fellowship for two years. Last year’s recipient, Beth Cookler, drew primarily upon two collections: the Gov. Barbara Roberts Papers supported her thesis on the impact of Measure 5 on Oregon’s public schools; and the Portland Japanese American Citizens League Records were incorporated into a primary resource-based history curriculum that tied local impacts to national narratives. Beth completed her Master’s June 2014 and has returned to teaching history at Sunset High School. The Library is grateful to Corey and Stacey Lohman for their generosity in supporting student research, and we are proud of the work done by our excellent Special Collections Research Fellows.